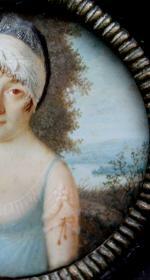 Portrait miniature on ivory depicts a young lady with alandscape on the background. . 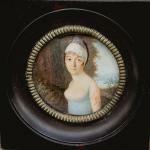 This extremaly fine miniature work was executed by Louis Antoine Collas (1775-after 1829), important French portrait and miniature painter . Collas's work primarily consisted of oil paintings and miniature watercolours. Collas recieved acknowledge in Russia and America , where he spent years of life and work. Louis Antoine Collas was born in Bordeaux, France in 1775. Little to no information can be found on the early childhood of Collas. Collas started his art career and studied under François-André Vincent in Paris. He debuted at the Paris Salon in 1798 with one self portrait. The next year he sent several miniatures to the Paris Salon and would periodically continue to do so. Between 1803 (though it is claimed he moved in 1808) and 1811, Collas moved to St. Petersburg, Russia where he painted aristocrats and various people of high status. While in Russia, Collas worked for Czar Alexander I's court. Other notable figures that he painted while in Russia were Duchess Catherine Pavlovna and Prince Serge Nikolaewitch Galitzine. 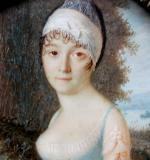 Collas left Russia in 1811 and moved back to Paris. After returning to Paris, Collas exhibited at the Paris Salon of 1812. In 1812 he moved to USA. 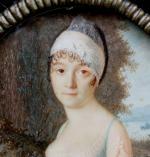 Collas was one of the most influential and important French miniature painters that came to America and New Orleans. He exhibited in the Paris Salon as well as several Academies of Fine Arts in America. Although originally from France, Collas is considered an American artist. "We notice with pleasure at Mr. Elkin's Exchange a Frame enclosing miniature paintings by Mr. Collas. The finish of his portraits leave nothing to be desired for resemblance. We can compare it with the life-sized portrait above the frame. It is a speaking likeness. Everyone can recognize the artist whom one of his colleagues has delineated. Unfortunately, fate has snatched Lancelin from us. I do not pretend to make any comparison between the two painters, but I will limit myself by saying that the real and beautiful talent of Mr. Collas should be encouraged in all cities, and since those I have seen in France, I have found nothing more graceful than his works." Collas announced his return in the New Orleans papers with notices almost every year after his flattering criticism. These notices stated ads such as "Collas, L.- Painter, Has the honor of informing his friends and the public of New Orleans, that he has returned to this city, and intends to exercise his art in portrait and miniatures." These adds continued from 1823 to 1829 normally around April and were nearly identical. Sometime between 1831 to 1832, Collas returned to Paris. He exhibited again at the Paris Salon, but didn't receive as much attention or notice as what he usually achieved. 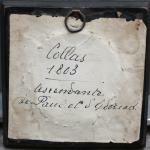 It is believed that Collas died in Paris in 1833, but no documentation can be found. Collas's place of death is unknown. Collas works are in museums of Bordeaux, (France); New Orleans, Los Angeles and Cincinnati (all USA) ; Ermitage (Russia) and in many famous prime collections around the world. Cincinnati Art Museum; Julie Aronson; Marjorie E. Wieseman (2006). 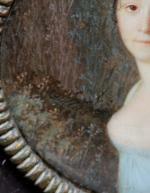 Perfect Likeness: European and American Portrait Miniatures from the Cincinnati Art Museum. Yale University Press. 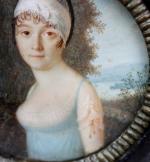 Inscription: signed and dated „ Collas, 1803“ lower right, on the back - French inscription with the artist‘s name and indistinctly name of the sitter. Technique: gouache on ivory. Original period frame with inner gilt bronze oval mount. Measurements: unframed d 2 5/8" (6,5cm), framed w 4 1/2" x h 4 1/2" (11,5 x 211,5 cm). Condition: in very good original condition.